Discussion in 'The Toyark' started by seeker311, Feb 27, 2008. Found the Jakal, Brute, Master chief, Spartan soldier at Walmart. I just got Chief and the Spartan soldier which was blue. Bout freaking time they showed up retail. Active camoflauge are Spawn Store exclusive (EVA). Wait, wait... these are available at Wal*marts? Hot damn! Picked up Chief yesterday at Wal Mart as well. Haven't had a chance to open him up yet. He looks pretty nice. Bought a couple of MC this morning I was sure surprised that walmart was carrying them. He is freakin sweet! I thought the Grunts came in a two pack? Darn, didn't know the blue ones were exclusive. I actually saw a mid-aisle display for these (bumping Deluxe TFs off, in fact) last weekend and I presume most of the first wave was actually there. I'll have to correct that mistake when I also hunt down the Cybertron repaints THIS Saturday! Nope, grunts are packed individually, and have two color variations. Don't know if one is rarer or they're in equal quantity. I got a white Spartan from my local comic shop, and a Steel CQB on the way from GameStop. 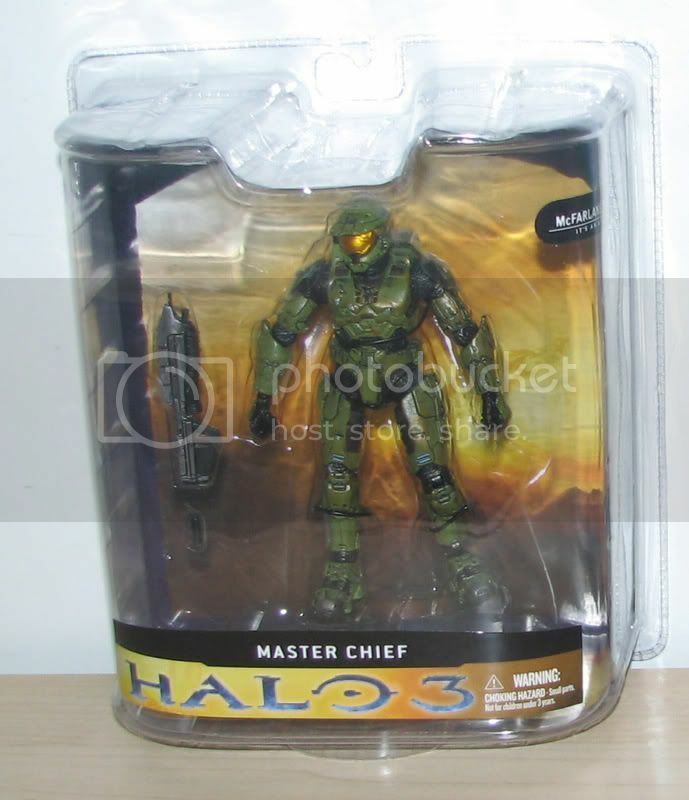 Hmm, I'm not a Halo fan myself, but I do like the look of that Master Chief figure. I might have to keep an eye out for these if I have the money and they make it to Australia. Hot damn. I am going to have to head to Wal-Mart tonight. OK...what the heck is Spawn Store...never heard of it. Let's see some opened toy pictures already!!!! Does anyone know if they'll be releasing a scale Warthog, Hornet or Pelican to go along with these figs? Simple enough concept. There was a pre-order for the active camo exclusive that ended last year, and it goes up for sale (and pre-orders ship) in May. Standard Halo stuff is available in March. So far, there's three-inch scale partially diecast vehicles planned, but no full-size ones. Nothing in scale just small die cast vehicles so far. What was the price at Walmart? I saw them at Gamestop but wasn't going to spend the $12.99 for the size (and no Master Chief just Red and White Spartans). Ask and ye shall receive. Sorry I only picked up him. I don't play Halo, I've only done so a couple of times. The toys are cool though. Very detailed, posable (MC has 18 pts of articulation), and are reduced from doll-ish sized to more action figure-y. THese aren't due to stores for another 6 days. Was around $10 at Wal Mart. D00d we posted at the exact same time! Nice size comparison. They had like 5 blue ones at the walmart I went to and a handful of the Brutes. I opened both of mine, the master chief and blue spartan soldier. Ill have to check gamestop. In the box, comes a booklet that shows the other figures and vehicles.